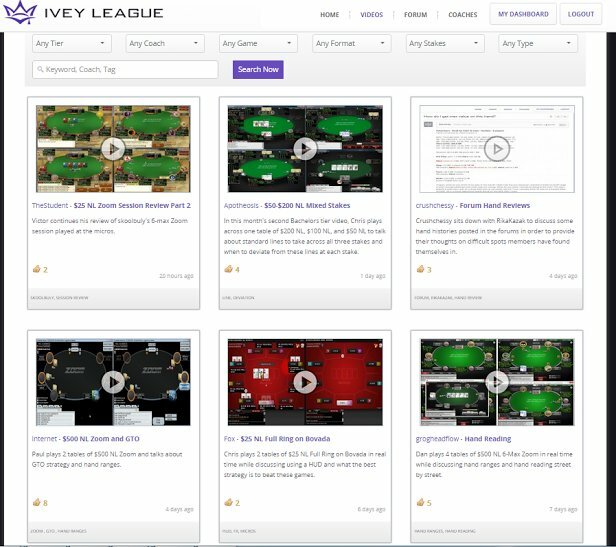 Ivey League is an online training site founded by poker pro Phil Ivey. The site launched in early 2014 and has over 30 of the top poker players in the world showcasing how they approach a variety of poker-related situations for tournament and cash game play. Ivey League is the home to Phil Ivey, one of the top live and online professional poker players in the game. 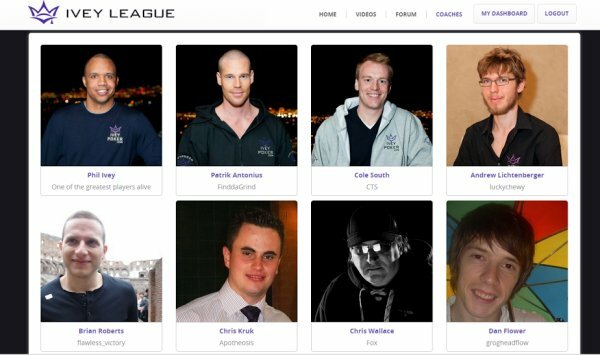 Ivey combined content from his previous acquisition of Leggo Poker, providing training videos from Aaron "aejones" Jones, Peter "Apathy" Jetten, and Andrew "luckychewy" Lichtenberger. The training site is very easy to navigate and has filters for "Tier," "Coach," "Game," "Format," "Stakes," and "Type" to help you find the content you are looking for. Watching the video literally just takes two clicks of your mouse. You can also view comments others have had on the videos and add comments of your own. There are three plans available at Ivey League: Undergraduate, Bachelors, and Masters. The Undergraduate plan is free and gives you access to the poker forum and videos in the Undergraduate tier. There are at least 35 training videos available to watch for free, with more being added a little more than once a month on average. This plan will give you a great feel for what you can get for your money in one of the other more extensive plans. The Bachelor plan includes everything the Undergraduate plan does plus access to videos in the Bachelor tier. The plan is very cheaply priced at $9 per month or $70 per year and gives access to almost a new video every day on a wide variety of topics. The Masters plan is for players who are truly serious about taking their game to the highest levels. The plan costs $75 per month or $500 a year and gives you full access to everything on the site, including premium videos released in the Master tier. The only criticism we have about the site is the lack of a plan that fits between the Undergraduate and Bachelors plan since the price jump from $9 to $75 per month is a bit steep. It is easy to see why poker players striving to be among the best in the game flock to Ivey League. Players on a limited budget can get top-notch poker training from the biggest names in the game without spending the huge sums of money required to get private coaching on this level.